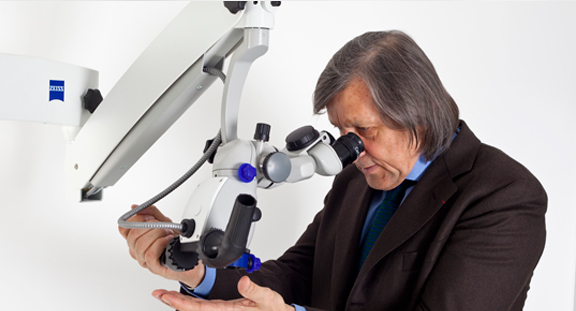 Microscope assisted Endodontics treatments presently represent the most complex work formula in Endodontics . Our clinic offers the possibility to benefit of such treatments by putting at your disposal high performance equipment and specialized doctors trained in these top dental techniques. An Endodontics examination lasts about 45 to 60 minutes and develops in 4 stages, each equally important in the diagnostic precision and the treatments’ success. In the second stage the dentist carefully examines with the help of manual labor and special devices, the presumed problematic tooth as well as those with which it comes in contact when the patient has his mouth closed. An extremely important element is the Endodontics microscope– a device which magnifies and gives sufficient bright light to notice details which can’t be seen with the bare eye. Next-radiographies are taken. During the Endodontic treatment multiple sets of radiographies are taken. At the beginning at leas two are necessary. After the dentist puts in order all the pieces of information, the last and maybe the most important part of the examination follows: the treatment plan is designed and explained to the patients’ understanding, as well as the cost and time period it implies. The length on which the Endodontic treatment is done is mandatory determined by an electronic device called apex locator and verified with the help of several radiographies taken with a needle in each radicular channel. Next is root canal obturation, which is designed to “seal” against future bacteria invasion which could re-infect the tooth and therefore jeopardize root canal treatment. …one or more “check-up” radiographies are taken to verify the procedures’ correctness. Even though many people consider the Endodontic treatment is completed after the root canal obturation, there are at least two equally important steps for the tooth’s health and longevity on the arcade. The first one is tooth restoration (recovery) which can consist of coronary obturation (dental filling) or dental crown (with or without intra radicular dental implant. Long term monitorization is the second step. It consists of periodical consults (after 6 months, 1 year, 2 years, etc) and check-up radiographies. Do you want to learn more about the beauty of your smile?